I'm relatively new to running so looking for some advice. I have a pain/tightness right at the top of my thigh/groin when I've been running for a wee while, not huge distances, did 4 miles today at the Portobello Promathon and it was pretty painful from around mile 2, just seems to get tighter and tighter the further I go, now really tight, stretching it out is proving to be.....interesting! Any ideas what it could be or how I could resolve this issue? It is predominently left side but today the right was joining in too! Many thanks and all the best for a happy and injury free 2013. I had similar problem last year but I actually eventually tore my adductor and it took months to heal. My advice would be to see a sports therapist to see if its a tight spot that can be worked on. My issue was ultimately an instability in my hips (very clicky!) which caused me to overwork my quads. I would definitely suggest getting it looked at now. I ran and ran until I tore the muscle like a fool! However someone else might have less hysterical advice!! Cheers Franners! I have to say that today they are really painful, I'm walking talking much shorter strides than I normally would. Did you have massage once you'd found out the issue? Are you back running now? Oh yes! Back running with no problems. The only reason I was out so long was because I kept running on it even after I'd hurt myself which was stupid but I was training for a marathon and got silly! I had it massaged after injury and it slowly got better. I know a groin pull is quite common and I had lots of different advice re: mine. If I had sorted it earlier then I wouldn't have been off running for so long. Would live to know how you get on! I would also definitely see a sports therapist. It could be something simple like tight hip flexors or a sign of an underlying hip problem. Not to scare you but I had similar symptoms that were eventually diagnosed as hip dysplasia (shallow sockets) that led to a string of surgeries, some major before I was able to walk or run pain free again.However thats an extreme case but highlights that if something hurts and doesnt improve with rest, follow your instincts and get it checked out. In a similar boat to you and I'd say go and get it checked out (something I keep meaning to do!!) and to stop running. I was on the mend and went out for a few runs that have left me back where I started (not quite as bad as it was but annoying all the same). Thanks for the replies. 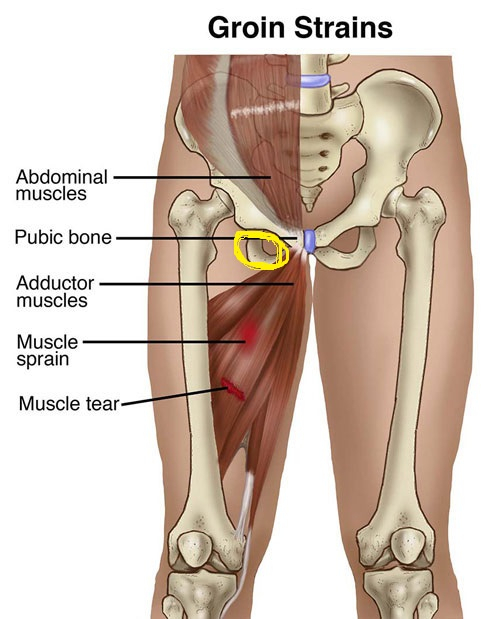 I've bit the bullet and have seen a physio who reckons that the problem is coming from a weak left hip and weak core, she also said I've got quite a bit of scar tissue on the adductor. So, I've been given exercises to do and have another appointment to see her next week. I've been running twice since I saw her, didn't have the groin pain the first time but did have it the second time....all very odd. Hope I can get it sorted, I feel fitness wise I'm good to go but this niggle is really holding me back. Thanks for the advice guys, hope you all get on the mend and continue to go from strength to strength. Hi Feistywoman - I have exact same problem - seeing physio once a week to try and break down the scar issue and lots of exercises to do ( as I also have a problem with my hip) It always comes down to the same thing weak core !! My pain ( more of an ache) comes on at about mile 7 - in shorter runs I'm absolutely fine - I do do a lot of stretching now before I even go out the door to get some warmth into the muscles - aee you doing that ? After a run, my partner feels discomfort near to the groin area, as per attached picture. Will try and book a sport therapist now, anything I can do in the mean time, hot & cold treatments etc? Trying a different way to attach photo. I've had a slightly tight right groin for a while now. Then last weekend, having done more running than I usually do in a week, I had a sharp pain in my right knee when doing weight-bearing (squats, lunges, step-downs etc). Booked to see the physio, and he measured my hip abduction strength. My right leg was more than 20% weaker than my left. Weak hip abduction and tight hip flexors can cause all sorts of problems such as lower back pain, groin pain, and knee pain. Your partner could try hip abduction stretches and strengthening exercises, they can't do any harm even if that's not the direct cause.